This tutorial will guide you in the process of configuring a LoRa module in a PC with the aid of a LoRa Gateway, and testing the reception and sending of LoRa packets from Waspmote, Plug & Sense!, Arduino, Raspberry Pi or Intel Galileo. To perform these actions you need a LoRa node and a LoRa Gateway, the device that allows you to communicate through a USB port with the module. You also need a terminal program like Cutecom (Linux), Hyperterminal or Putty (Windows). There are plenty of this type of program, so you can use the one you are comfortable with. You have to select the port in which your system has detected the gateway. It’s usually /dev/ttyUSBX in Linux and COMX in Windows. INFO – With this command, the module gives its setup. As you need to send non-printable characters hexadecimal characters, you will need a way to enter these characters in the terminal. Programs as Cutecom allow to enter hexadecimal numbers to enter these characters. In this case, translate to hexadecimal all the characters in the command. If you are using another program, you can use some tools to edit hexadecimal characters. In order to read the setup of the module, you have to send a READ command. CR+LF characters (Carry return + line feed -ASCII 0x0D and 0x0A). Setup data “;” separated. Each data will have the format “NAME:value”. The fields of this command are: FREC, ADDR, BW, CR, SF, RSSI and SNR. Last two parameters are optional. CR+LF characters (Carry return + line feed – ASCII 0x0D and 0x0A). SF (Spreading factor): SF_X where X is a number between 6 and 12. CR+LF characters (Carry return + line feed – ASCII 13 and 10). Let’s see a complete example step by step. 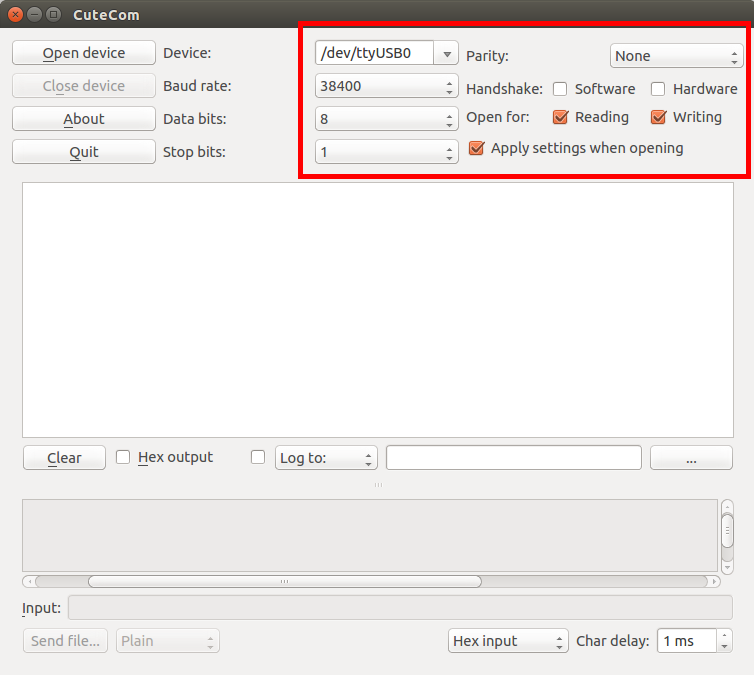 When the resulting command is executed, the module will try to setup these parameters and in case of success, it will reply with an INFO frame confirming the new setup data. In case of one of the parameters couldn’t be set in the module, it will keep its old setup in ALL the parameters and reply with an ERROR frame. If the controller of the module detects a problem in the communication, it will reply with an ERROR frame. This frame informs of the problem, that could be for example a CRC error in the command or an error in one of the parameters to write. Error Message in ASCII. This will be an explicit message of what the error is. When you have started a connection with the module in your terminal application, the module will automatically send through the serial port the frames received from any Waspmote. These frames will have the data frame structure described in the Waspmote frame guide. You can read further about Waspmote data frame here. You can send data from your LoRa gateway to any other LoRa equipped device. You can send data to Waspmote and Meshlium. Destination address: Number between 1 and 255. 0 for broadcast message. Message type. Allowed type is ASCII (text). Also binary type is allowed but it is not implemented. Message to send. If you want to send non-printable ASCII chars you need to escape them before with the character ESCAPE (ASCII 0x1B) and the character you want to send. You have to escape too the character # (ASCII 0×23) in order to put it in a message. In case of a broadcast message, there is no way to ensure that the message has been delivered. No ACK will be received in this case. If the message could not be delivered, the module will return an ERROR message with “NOT SENT” in case of the module could not send the message and “NOT RECEIVED” in case it could not confirm that the message has been properly received.